You know how it is, you wait ages for one and two come along at the same time. 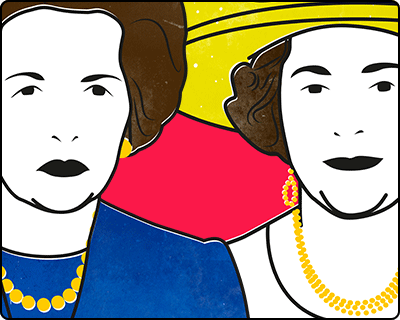 After Peter Morgan’s The Audience, centered around the weekly meetings of the Queen with the prime minister in office, a second play, Handbagged by Moira Buffini staged at the Tricycle theatre, talks about the relationship between the Queen and Margaret Thatcher. If The Audience is the blockbuster version (West End staging, Helen Mirren as the Queen), Handbagged is the indie alternative version. And for all its weaknesses, and there are some, it has the indie spirit and bold ambition to match it. The premise is simple: the play tells the story of Margaret Thatcher’s time in power through her meetings with the Queen. We start with the first meeting, we finish with the last. The simplicity of the approach is deceptive: we have two Queens and two Thatchers, each woman with a younger and older version, all on stage at the same time, power and reflection, decisive action and dry wit. Around the two women (or is it four? ), a plethora of other characters are played by two actors: Denis Thatcher, Ronald Reagan, Nancy Reagan, Geoffrey Howe, Rupert Murdoch, Gerry Adams, Neil Kinnock, the list goes on. The characters are in the story, comment on the story, explain themselves, step out of the story, become actors who play a story. It’s not as confusing as it sounds, but it’s not lean either. There is too much ground to cover, too much exposition, too much wit and words and changes of direction competing for attention. The play doesn’t suffer from lack of ambition, but there might be too much of it. Indhu Rubasingham directs with assurance and gives definition to the passage of time and the action. The pace, often frenetic, gives the performance energy (although it discourages contemplation) and the set, with its clean straight lines, lets the play breath. The six actors have fun with the material: Marion Bailey as the older Queen has the dryness and composure of a thousands lives lived, and Stella Gonet as the older Thatcher is compelling playing the immobility of a frozen soul (the hair and make up is impressive). Fenella Woolgar as the younger Mags maps the restless confidence as it progresses into rigidity and Jeff Rawle produces magic with people appearing and disappearing before your eyes. Actor 2: Whole communities lost their work. It was a tragedy; it was heartbreaking. Actor 2: No one important. It’s a heart-stopping moment, its significance and weight cutting through like a knife. This entry was posted in Reviews and tagged Fenella Woolgar, Indhu Rubasingham, Jeff Rawle, Moira Buffini, Stella Gonet, Tricycle Theatre. Bookmark the permalink.